What cat-safe plants should I put in my catio? The answer to this one can be a bit tricky. While there are lots of great plants that cats love and aren’t toxic, it’s important to note any plant can be eaten by your cat and may cause vomiting or choking. So it’s always a great idea to check out the ASPCA’s Toxic and Non-Toxic Plant List before adding new or unknown plants to your home and catio. Wheat Grass: Though the health benefits of wheat grass are still up in the air, there are no toxic side effects to your cat nibbling at the long fronds of wheat grass. If your cat loves nipping at it and you like the aesthetic, consider it a good candidate. 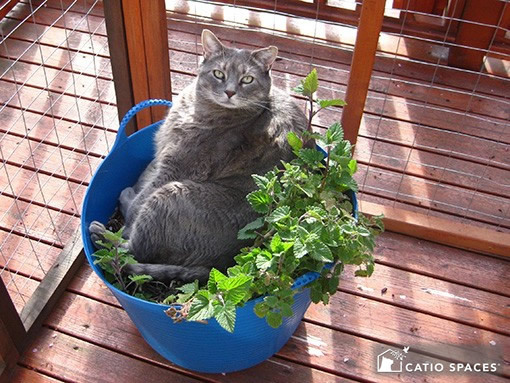 Catnip: Everything in moderation is important, including with catnip in your catio. While it may be counter-intuitive this choice plant for so many cats can have some side effects, including diarrhea and vomiting. Of course, if your cat loves catnip and you provide it in moderation, it can be fun and adorable to watch as your kitty rolls around and celebrates spring in a pot of it! Other types of “Cat Grass”: Experts are unsure why but cats tend to gravitate towards grasses of all kinds. The folks over at PetMD have some great information on what cat grass is and how to grow it at home. 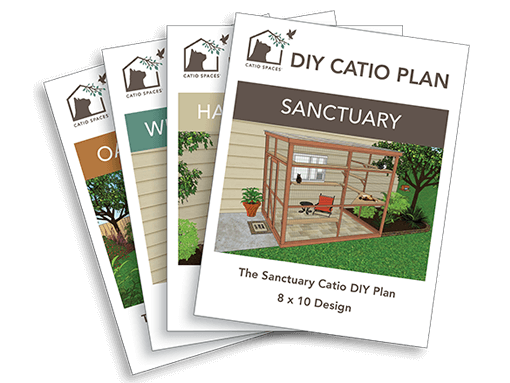 An excellent complementary project to your beautiful DIY catio. Creeping Zinnias: A low maintenance plant with pretty yellow flowers, creeping zinnias can brighten up any day. They thrive in sunny spots and in planters or hanging baskets, making this plant a great choice for a window box catio or a catio without a grassy floor. Marigolds: The “herb of the sun,” marigolds are a classic choice for beautifying outdoor spaces. Plus they are very resilient to very hot weather (though your kitty may or may not agree). 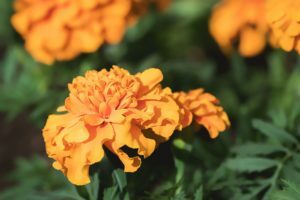 Marigolds’ sweet fragrance and long bloom-time can be a great complement to any catio space, in the ground or even in pots scattered where all can enjoy. Impatiens: Found in a variety of vibrant colors, Impatiens is both classified as non-toxic for cats and does well in shady, moist environments. 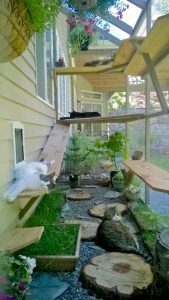 If your catio or cat enclosure has a darker shady spot, adding some impatience there might be purrrrrrfect. Asparagus Fern: Not to be confused with other ferns as some can be toxic, asparagus ferns are an easy keep. Plus, in the winter, you can bring them inside to clean the air and bring them back outside next spring for your cat to enjoy! Thyme: Do you know how amazing this smells? Thyme is considered non-toxic for your cat (and you) to nibble on and can be a nice, fragrant addition to any cat enclosure. Rosemary: Another with a distinct aroma that freely wafts through smaller spaces is Rosemary. It’s sure to grab your cat’s attention and offer a nice taste to your dinner. No matter what plants you decide to include in your catio (and there are plenty to choose from), be sure to check that your gardening supplies are pet-safe as well, including non-toxic fertilizer. This will help make sure life is good in your catio for years to come! Are you considering adding a catio to your house? If so, one of our DIY plans may be the purrfect fit!